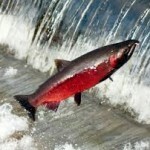 Following heavy winter rains, coho salmon swim up the rivers and creeks to spawn. However, many of the already threatened species are stranded in the ocean waiting for the surge of water that signals the beginning of their annual migration, a sign that may never come because creeks are blocked by sand bars, according to biologists. Coho are born in freshwater rivers and streams where they live for about a year before heading to the ocean. At about age 3, the fish swim upstream to lay and fertilize eggs. Steelhead trout, which are listed as threatened under the Endangered Species Act, are also stranded offshore. However, steelhead are more resilient than coho and can wait a year to spawn. Migratory fish have been threatened for many years because the regulatory agencies only have enough funding for their paychecks and do very little enforcement. Even gross violations go uncheck because of politics and orifice splunking. Surely our governmental overseers can use this opportunity to enact something to take something from us.